Purpose: Onset of type 2 diabetes (T2D) is often gradual and preceded by impaired glucose homeostasis. Lifestyle interventions including weight loss and physical activity may reduce the risk of developing T2D, but adherence to a lifestyle change is challenging. As part of an international T2D prevention trial (PREVIEW), a behavior change intervention supported participants in achieving a healthier diet and physically active lifestyle. Here, our aim was to explore the influence of this behavioral program (PREMIT) on social-cognitive variables during an 8-week weight loss phase. Methods: PREVIEW consisted of an initial weight loss, Phase I, followed by a weight-­maintenance, Phase II, for those achieving the 8-week weight loss target of ≥ 8% from initial bodyweight. Overweight and obese (BMI ≥25 kg/m2) individuals aged 25 to 70 years with confirmed pre-diabetes were enrolled. Uni- and multivariate statistical methods were deployed to explore differences in intentions, self-efficacy, and outcome expectancies between those who achieved the target weight loss (“achievers”) and those who did not (“non-achievers”). Results: At the beginning of Phase I, no significant differences in intentions, self-efficacy and outcome expectancies between “achievers” (1,857) and “non-achievers” (163) were found. “Non-achievers” tended to be younger, live with child/ren, and attended the PREMIT sessions less frequently. At the end of Phase I, “achievers” reported higher intentions (healthy eating χ2(1)=2.57; P <0.008, exercising χ2(1)=0.66; P <0.008), self-efficacy (F(2; 1970)=10.27, P <0.005), and were more positive about the expected outcomes (F(4; 1968)=11.22, P <0.005). Conclusion: Although statistically significant, effect sizes observed between the two groups were small. Behavior change, however, is multi-determined. Over a period of time, even small differences may make a cumulative effect. Being successful in behavior change requires that the “new” behavior is implemented time after time until it becomes a habit. Therefore, having even slightly higher self-efficacy, positive outcome expectancies and intentions may over time result in considerably improved chances to achieve long-term lifestyle changes. Projections estimate that by 2030 diabetes will be the fourth highest cause of disease burden in high-income countries such as in Australia and Finland.1 The most common form of diabetes, type 2 diabetes (T2D), is caused by the body’s inability to secrete and respond to insulin effectively. Typically, T2D develops gradually with an intermediate state between normal insulin sensitivity and T2D that is termed pre-diabetes and characterized by impaired glucose tolerance (IGT), impaired fasting glucose (IFG), or both.2–4 While inherited characteristics influence the risk of developing T2D, evidence is clear that lifestyle factors such as sedentariness, physical inactivity, and high energy food consumption leading to overweight and obesity are major risk factors for developing T2D. The aim of this paper is to explore whether PREMIT intervention regarding self-efficacy for eating healthier diets and increasing physical activity, outcome expectancies, and intention to eat healthily, lose weight, and being physically active during Phase I was associated with weight loss. The emphasis in this paper is in analyzing differences between those who achieved (“achievers”) and did not achieve (”non-achievers”) the required ≥ 8% loss of body weight during Phase I of PREVIEW to continue into the Phase II of PREVIEW. The central premise of the PREMIT was that different social-cognitive determinants were assumed to have a more defining role as the intervention progressed through four stages of the participant’s willingness to change their behavior: (1) contemplation in Phase I of PREVIEW, (2) preparation to act at the end of Phase I and at the beginning of Phase II, (3) action, and (4) maintenance during Phase II (Figure 1). Figure 1. Intervention and data collection structure. Abbreviations: PREVIEW, prevention of diabetes through lifestyle intervention and population studies in Europe and around the world; PREMIT, the preview behavior modification intervention toolbox; RCT, randomized controlled trial; CID, clinical investigation day. The core objective during Phase I of PREVIEW was to persuade participants that while they were at high risk of developing T2D, they were able to reduce their risk (outcome expectancy) by starting an active lifestyle and following a risk-reducing diet during Phase II. A critical objective of this stage (1) was to ensure participants’ willingness to change their behavior by building up positive outcome expectancies, reinforcing implementation intentions and fostering participants’ self-efficacy. During the 8-week LCD phase of the PREVIEW RCT (Phase I), five group counseling sessions were scheduled to address these psychological objectives: at baseline, and at weeks 2, 4, 6, and 8. Participants were recruited to the PREVIEW RCT between August 2013 and March 2015 from the intervention sites in University of Copenhagen (UCPH), Denmark; University of Helsinki (HEL), Finland; University of Nottingham (UNOTT), UK; University of Maastricht (UM), the Netherlands; University of Navarra (UNAV), Spain; Medical University of Sofia (MU), Bulgaria; University of Auckland (UOA), New Zealand; and University of Sydney (UNSYD), Australia. Overweight (BMI ≥ 25 kg/m2) men and women aged 25 to 70 years with confirmed pre-diabetes and willing to be randomized were eligible for inclusion. Pre-diabetes was confirmed by an oral glucose tolerance test (OGTT) using the American Diabetes Association criteria. It should be noted that from mid-2013 to mid-2014 participants aged 25–45 and 55–70 years were enrolled, but from mid-2014 participants aged 46–54 years were preferably enrolled as per published study protocol.11 All participants enrolled in the study provided a written informed consent. Participant recruitment was done by advertising in both print and visual media, and by contacting primary and occupational health care providers for referrals. The Ethical Committees in the participating countries approved the study protocol (The Secretariat of Research Ethics Committees for the Capital Region of Denmark, Denmark; The Coordinating Ethics Committee of the Helsinki and Uusimaa Hospital district, Finland; The Medical Ethics Committee of Maastricht University Medical Center, the Netherlands; East Midlands—Leicester Central Research Ethics Committee, UK; Clinical Research Ethics Committee of Navarra, Spain; Commission on Ethics in Scientific Research with the Medical University—Sofia (KENIMUS), Bulgaria; Ethics Review Committee at the Sydney Health Local District, Australia; Northern B Health and Disability Ethics Committee, New Zealand). The PREVIEW study is registered in https://clinicaltrials.gov/ (NCT01777893). As shown in the Figure 1, outcome measures used in this paper were collected at two clinical investigation days (CIDs). These CIDs were at the baseline of Phase I of PREVIEW RCT (CID1) and at the end of the Phase I (CID2). Data collection included both anthropometric (e.g., body weight and height), physiological (e.g., HbA1c) and the social-cognitive determinants of behavior change relevant to this paper. Of the anthropometric and physiological parameters, only body weight information is included in the current analysis. All psychological measurements were collected using standardized questionnaires. For non-English speaking countries, questionnaires were translated into Bulgarian, Danish, Finnish, Dutch, or Spanish. Accuracy of the translations were checked by back-translating the local version in to English and comparing with the original English version. Participant body weight was measured at CID1 and CID2. European Social Survey and International Social Survey38 was used to collect information on gender, year of birth, citizenship, spoken language, highest educational level, marital status, number of people living in the household, employment status, work status, and households’ financial income. The instrument to measure participants’ intention was adapted from Renner and Schwarzer39 and included three separate questions such as “I intend to lose weight” to assess intentions to eat as healthily as possible, to exercise regularly, and to lose weight. Response options ranged from “1” (don´t intend at all) to “7” (strongly intend). High scores indicated strong intention to perform the behavior, e.g., lose weight. Participants were asked how certain they are to overcome barriers for both diet (5 items) and physical activity (5 items). Participants were asked to answer questions such as “I can manage to stick to a healthy diet, even if I have to rethink my entire diet”. Response options ranged from “1” (very uncertain) to “4” (very certain).39 For both dimensions, a mean value was calculated ranging between 1 and 4, with low scores reflecting low self-efficacy and high scores reflecting high self-efficacy. Internal consistencies were calculated using Cronbach’s alpha, which for CID1 and CID2 for diet were α = 0.89 and for exercise α = 0.91, indicating sufficient reliability. The instrument assessing participants’ confidence in staying physically active (11 items) and adhering to a healthy (3 items) diet despite upcoming barriers was adapted from Renner and Schwarzer.39 Participants were asked to respond to statements like “I am sure I can keep being physically active regularly, even if I am tired”. Responses ranged from “1” (not at all true) to “4” (exactly true). For both dimensions, a mean value was calculated ranging between 1 and 4, with low scores reflecting low coping self-efficacy and high scores reflecting high coping self-efficacy. Data for coping self-efficacy was collected at CID2. Cronbach’s alpha for CID2 for diet was α = 0.89 and for exercise α = 0.94. Outcome expectancy of behavior change was assessed for a healthy diet with 12 items and exercising regularly with 13 items.39 Participants rated expected benefits and disadvantages of behavioral change from “1” (not at all true) to “4” (exactly true). Participants were asked to rate statements such as “If I eat as recommended in PREVIEW, food won’t taste as good”. For both dimensions, a mean value for benefits and disadvantages was calculated, ranging between 1 and 4. Low scores reflected fewer expected benefits/disadvantages and high scores reflect more expected benefits/disadvantages. Cronbach’s alpha for CID1 and CID2 for benefits of diet were α = 0.70 and α = 0.73 and for exercise α = 0.79 and α = 0.85. For disadvantages, Cronbach’s alpha at CID1 and CID2 for diet were α = 0.67 and α = 0.65, and for exercise α = 0.61 and α = 0.63. All analyses have been conducted with the IBM® SPSS Statistics Program version 23. Descriptive statistical methods were used to describe the socioeconomic characteristics of the participants at the baseline and are reported as mean ± SD for age and n (%) for other characteristics and attendance to PREMIT group counseling sessions. Data are reported separately for “achievers” and “non-achievers”, based on the variable “eligibility” in the dataset. Chi-square tests and independent sample t-tests with correction for unequal variances due to different group sizes were used to evaluate between group differences across a single time point. Before outcome variable analyses and data imputation extreme univariate outliers (±3 SD) were identified for the continuous outcome variables (intention, self-efficacy, and outcome expectancies) and removed. “Impute missing data values” option was used for multiple data imputation with fully automatic method using age, gender, BMI at CID1, achievement of weight loss target, intention, self-efficacy, and outcome expectancies as predictor variables. Five multiple imputed datasets were generated. Sensitivity analyses were performed with the original data and reported if results differed from the principal analysis. For outcome variables, results are also reported separately for “achievers” and “non-achievers”. While very high intentions were expected as participation required commitment to lose weight and increase physical activity, data were considered too skewed to allow for meaningful parametric testing. Therefore, based on mode, each intention variable was transformed into a categorical variable with two levels “very high intention (scores 6.5 to 7)” and “Not very high intention (scores 6.49 to 1)” to enable simplified comparative analyses. Due to multiple comparisons, Bonferroni adjusted P-value of 0.008 was used. A two-way mixed design multivariate analysis of variance (MANOVA) was used to examine differences over Phase I between eligible and ineligible participants for self-efficacy and outcome expectancies. Pillai’s Trace criterions were used throughout due to considerable difference in the group sizes. Results of the evaluation of the assumptions for the multivariate analyses were satisfactory. The two-way mixed MANOVA was performed separately for the self-efficacy and outcome expectancies due to low correlation between these two outcome measurements. For both analyses achievement of the weight loss target (“achievers” and “non-achievers”) was used as a between-subject variable and time (CID1 and CID2) as within-subjects’ variable. After main analyses, simple effect analyses effectively compared differences between “achievers” and “non-achievers” at CID1 and CID2 using Bonferroni adjustment P ≤0.025 for self-efficacy and P ≤0.0125 for outcome expectancies. The pairwise within-subjects’ comparisons used Bonferroni correction P ≤0.0125 for self-efficacy and P ≤0.006 for outcome expectancies. Coping self-efficacy for diet and physical activity at CID2 between “achievers” and “non-achievers” was evaluated using an independent samples t-test. Bonferroni correction (P ≤0.025) was used due to multiple pairwise tests. Altogether, 15,611 individuals were pre-screened using telephone or internet questionnaire, 5472 individuals were then screened in clinic, and 2326 were found eligible to participate in Phase I of the study. Of these, 2224 individuals attended CID1 and started Phase I of the PREVIEW RCT, with a dropout rate of 9.2% during the 8-week period between CID1 and CID2. The vast majority of the participants who dropped out before CID1 or between CID1 and CID2 withdrew their consent due to personal reasons such as change in life or health situation. The analyses reported in this paper are based on 2020 participants with body weight data collected at CID2, of which 1857 achieved ≥ 8% body weight loss (“achievers”) and 163 did not reach the weight loss target (“non-achievers”). Participant characteristics as measured at baseline are shown in Table 1. A t-test with unequal variances assumed indicated that “non-achievers” were significantly younger at the start of the trial, t(185) = –2.37, P <0.05. There were no differences in gender (Pearson χ2(1) = 2.39; P > 0.05), marital status (Pearson χ2(1) = 3.82; P > 0.05), living in a household with other adults (Pearson χ2(1) = 3.07; P > 0.05), or being in paid employment (Pearson χ2(1) = 3.93; P > 0.05) between “achievers” and “non-achievers”. “Non-achievers”, however, reported more frequently having at least one child living in the household (Pearson χ2(1) = 8.59; P <0.05) and being other than of Caucasian ethnicity (Pearson χ2(1) = 10.24; P <0.05). Participation in the behavior modification sessions declined during the LCD phase between CID1 and CID2 especially among “non-achievers”. As shown in Table 2, from the second group counseling session “non-achievers” were significantly less likely to be recorded as having received the group instructions (i.e., attended the group counseling session) (second session χ2(1) = 9.61; P <0.01, third session χ2(1) = 10.78; P <0.01, fourth session χ2(1) = 9.97; P <0.01, fifth session χ2(1) = 219.03; P <0.01). The low attendance at the final group counseling session by “non-achievers” was unsurprising. Only 53 (32%) of the 163 “non-achievers” attended this fifth session. Abbreviation: CID, clinical investigation day; LCD, low-calorie diet. Means, standard deviations, and the number of participants for the behavioral modification outcome measurements after data imputation and removal of extreme outliers are shown in Table 3. Due to a technical data collection error, data were missing at CID1 and CID2 for advantages and disadvantages of regular exercise for one study site (UCPH, n = 335). Notes: For self-efficacy and coping self-efficacy (diet and physical activity), higher scale value indicates higher self-efficacy. For intention (weight loss, nutrition, physical activity), higher scale value indicates higher intention. For outcome expectancies (benefits and disadvantages), higher scale value indicates higher expectations of benefits or disadvantages. Abbreviations: CID, clinical investigation day; n/a, not applicable. As shown in Table 3, mean values for intentions to eat healthily, exercise and lose weight were very high across CIDs and participant groups. At CID1 no significant differences between “achievers” and “non-achievers” were observed in reporting “very high intention” to eat healthily (Pearson χ2(1) = 2.57; P > 0.008), exercise (Pearson χ2(1) = 0.66; P > 0.008), and lose weight (Pearson χ2(1) = 0.59, P > 0.008). At CID2, however, “very high intentions” to eat healthily (Pearson χ2(1) = 20.99; P <0.001) were reported more frequently among “achievers”, though significance was reached for the imputed dataset only. Very high intentions to exercise (Pearson χ2(1) = 52.66; P <0.001) were also reported more frequently among “achievers”. No significant difference between “achievers” and “non-achievers” was found for intention to lose weight (Pearson χ2(1) = 5.30, P > 0.008). At CID1, there were no significant differences between “achievers” and “non-achievers” in self-efficacy for diet (F(1; 1971) = 0.49, P > 0.025) or physical activity (F(1; 1971) = 0.37, P > 0.025). At CID2, “achievers” reported significantly higher scores for both diet (F(1; 1971) = 7.11, P <0.01, η2 = 0.008) and physical activity (F(1; 1971) = 23.80, P <0.001, η2 = 0.012) self-efficacy. The effect sizes were small indicating that for diet self-efficacy 0.8% and for physical activity self-efficacy 1.2% of the common variance could be attributed by the group membership (“achievers” versus “non-achievers”). The pairwise within-subjects’ comparisons showed that for “non-achievers” diet self-efficacy scores did not change significantly between CID1 and CID2, while self-efficacy scores for physical activity reduced significantly, by –0.188 (P <0.001) on average. For “achievers”, the scores increased significantly for diet self-efficacy by 0.102 (P ≤0.001) and for physical activity self-efficacy by 0.47 (P ≤0.001) on average. Simple effects analyses for outcome expectancies indicated that at CID1 there were no differences between “achievers” and “non-achievers” in expectations of benefits of diet (F(1; 1971) = 0.71, P > 0.0125) and physical activity (F(1; 1971) = 4.98, P > 0.0125). However, at CID1, “non-achievers” reported higher expected disadvantages for diet (F(1; 1971) = 21.29, P <0.001, η2 = 0.011) and for physical activity (F(1; 1971) = 13.06, P <0.001, η2 = 0.007). At CID2, “non-achievers” continued to rate the disadvantages of diet (F(1; 1971) = 25.04, P <0.001, η2 = 0.013) and physical activity (F(1; 1971) = 13.10, P <0.001, η2 = 0.007) higher than “achievers”. Benefits of diet (F(1; 1971) = 24.76, P <0.001, η2 = 0.012) and physical activity (F(1; 1971) = 9.36, P <0.0125, η2 = 0.005) at CID2 were scored higher by “achievers”. Results continued to indicate very small effect sizes, so that between 0.5% and 1.2% of the common variance in outcome expectancies were attributed to the group membership. Pairwise within subjects’ comparisons among “non-achievers” suggested no significant changes for expected disadvantages of healthy eating or physical activity between CID1 and CID2. For “achievers”, scores for the expected disadvantages of a healthy diet decreased by –0.036 (P <0.006) and for physical activity by –0.088 (P <0.006) between CID1 and CID2. The scores for the expected benefits of a healthy diet decreased by –0.103 (P <0.006) and for physical activity by –0.128 (P <0.006) for “non-achievers”. For “achievers”, scores increased for expected benefits of diet by 0.117 (P <0.006) and for physical activity by 0.077 (P <0.006) between CIDs. Sensitivity analyses indicated different pattern of significance. Instead of interaction, significant main effects for both self-efficacy and outcome expectancies were found for the within participant variable “time” (CID1 and CID2) and the between participant variable “group membership” (“achievers” and “non-achievers”). For self-efficacy, the main effect for time was F(2; 1813) = 8.26, P <0.001, η2 = 0.009, while main effect for group membership was F(2; 1813) = 4.49, P <0.05, η2 = 0.005. The results for the outcome expectancies were for time F(4; 1487) = 4.14, P <0.01, η2 = 0.011 and for group membership F(4; 1487) = 6.64, P <0.001, η2 = 0.018. Bonferroni adjusted (P ≤0.025) within participant contrasts indicated that self-efficacy for diet (F(1) = 14.74, P <0.001, η2 = 0.008), but not for physical activity, increased significantly between the CIDs, while “achievers” reported significantly higher self-efficacy for physical activity (F(1) = 8.79, P <0.01, η2 = 0.005) but not for diet self-efficacy. For outcome expectancies (P ≤0.0125), within participants contrasts indicated significant change between CID1 and CID2 only in increased expectations of diet benefits (F(1) = 8.34, P <0.01, η2 = 0.006), whereas “non-achievers” reported higher expected disadvantages of diet (F(1) = 23.82, P <0.001, η2 = 0.016) and physical activity (F(1) = 15.97, P <0.001, η2 = 0.011). While results indicated no significant difference between “achievers” and “non-achievers” for the diet coping efficiency, at CID2 “achievers” reported significantly higher scores for physical activity self-efficacy (t(1971) = -3.14, P <0.01). Effect size was calculated as r = 0.006, indicating that only 0.6% of the common variance could be attributed to differences in physical activity coping self-efficacy. The primary purpose of this paper was to explore changes in social-cognitive variables among pre-diabetic individuals during the weight loss phase (Phase I) of a long-term lifestyle intervention. Cumulative evidence has shown that on a population level, key factors in decreasing the prevalence of T2D are decreasing overweight and increasing physical activity.3 Equally, research has shown that achieving long-term behavior change is challenging and knowledge of risk factors alone may not be sufficient to initiate the desired lifestyle changes.14 In the PREVIEW, RCT participants were actively supported in their lifestyle change efforts through the PREMIT program by building resilience to persist with the new behaviors. Results from this study suggest that the PREMIT intervention appears to be effective in supporting pre-diabetic individuals in their initial weight loss efforts and in preparing them for physical and dietary habit changes. Further, results also indicate that younger participants living with children may struggle to attend the PREMIT sessions and consequently miss support for lifestyle changes. The analyses presented in this paper explored changes in the behavioral determinants of intention, self-efficacy, and outcome expectancies among “achievers” and “non-achievers” of the weight loss target after an acute 8-week weight loss phase (Phase I of the PREVIEW RCT). While “achievers” and “non-achievers” were similar regarding gender, marital and employment status, and number of adults living in the household, “non-achiever” tended to be younger and live in households with at least 1 child. It is not clear from the data why “non-achievers” tended to be younger and have children. However, it could be hypothesized that pressures of combining work and family life are particularly acute for younger participants leaving limited capacity to concentrate on lifestyle changes, especially if this involves changing family habits. This notion was partially supported by the result showing that “non-achievers” were less likely to have attended the group counseling sessions. Alternatively, younger adults might be less concerned about the future consequences of the T2D and perceive that it will affect them only in middle/old age. Furthermore, data indicated that participants from non-Caucasian backgrounds were overrepresented among “non-achievers”. Yet again, it is not possible to ascertain the causes from the available data, but the results hint that cultural differences in diet and exercise habits may need to be considered in future trials. Although in-depth exploration of associations between outcomes and socioeconomic variables among PREVIEW participants was outside the scope of this paper, future research needs to consider the influence of socioeconomic characteristics in greater detail than was possible here. Intentions for eating a healthy diet, undertaking exercise and losing weight were found to be very high across “achievers”, “non-achievers”, and CIDs. As behavioral intention is considered a precursor for an action,34,35 it is not surprising to find high intentions among participants committed to a lifestyle intervention. 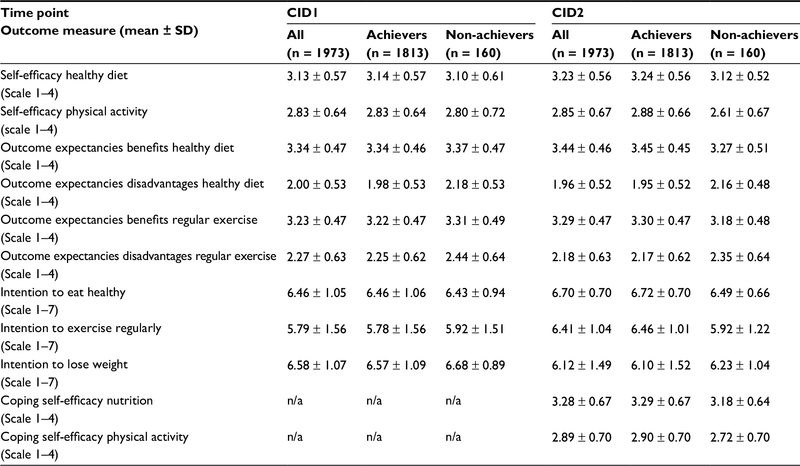 Although no differences at CID1 were observed between “achievers” and “non-achievers”, by CID2 “achievers” reported more frequently “very high intentions” for healthy eating and regular exercise. The observed differences may reflect changes in already achieved success and being mentally prepared for the Phase II of the trial. No differences were observed in intentions to lose weight. This may indicate that for the “non-achievers”, despite not achieving the required level of weight loss this time, achieving success at a later time point remains a strong intention. Interaction with weight loss success and the CIDs was found to be significant for both self-efficacy and outcome expectancies, although the amount of variance explained by the interaction was small. At the beginning of Phase I, there were no significant differences in self-efficacy for exercise and diet between “achievers” and “non-achievers”. At the end of Phase I, however, “achievers” did not only report higher diet and exercise self-efficacy than “non-achievers”, but also increased self-efficacy for both diet and exercise between CID1 (baseline of Phase I) and CID2 (end of Phase I). In contrast, “non-achievers” reported decreased self-efficacy for exercising between CIDs while showing no changes in diet self-efficacy. Although it is not possible to establish causality within this set of results, results are consistent with previous research linking increases in self-efficacy to successful outcomes.32,33 Interpretation of the results should, however, be cautious, as sensitivity analyses did not indicate interaction but main effects for outcome variables. Self-efficacy for diet, but not for physical activity was found to increase between CIDs, while, similarly with the principal analysis, “non-achievers” reported lower self-efficacy for physical activity. At CID1, participants had similarly positive expectancies of benefits of healthy diet and increased exercise. However, following Maddux et al37 and Miller et al33, at CID2 “achievers” reported higher expected benefits and less expected disadvantages than “non-achievers”. Furthermore, “non-achievers” indicated that while their expectations of disadvantages related to lifestyle changes had not changed during the Phase I, their expectations of benefits had slightly lessened. In contrast, “achievers” reported increased expectations of benefits of healthy diet and physical activity while expectations of disadvantages lessened during Phase I. As with the self-efficacy, these results should be interpreted cautiously as sensitivity analyses indicated significant main effects, but no interaction. Expectations of diet benefits had increased between CIDs, while similarly to principal analyses participants “non-achievers” reported higher expected disadvantages of diet and physical activity. Finally, results from the coping-self-efficacy analyses indicated that “non-achievers” were less confident in their ability of coping with increasing physical activity. The results indicate that, following the theoretical assumptions,19,34,42 beliefs about one’s capabilities and expectations of behavioral outcomes are associated with achieving the weight loss target. While at the start of the Phase I, there were no significant differences in self-efficacy and expected benefits of physical activity and healthy eating, ultimately “non-achievers” appeared to struggle with more negative expectations on changing lifestyle and lower self-efficacy during the Phase I weight loss. As the PREMIT intervention (stage 1) actively influenced participants’ beliefs about their capabilities and outcome expectations of behavior change, poorer attendance of the “non-achievers” at the group counseling sessions implied that missing crucial support reduces the likelihood of achieving behavioral changes. Further, authors such as Critchley et al36 have also pointed out that while behavior change interventions improve behavioral determinants such as self-efficacy, the behavior change may be attributed to increased knowledge of consequences of T2D, for example. Increase in knowledge was not estimated directly, but as behavior change techniques employed in the PREMIT included information about pre-diabetes, T2D, and benefits of prevention, it is reasonable to suggest that the intervention also increased participants’ knowledge. A key finding from the analyses was the “non-achievers” struggle to prepare themselves mentally for increasing physical activity. Small effect sizes indicated that only a very limited amount of group membership could be explained by self-efficacy and outcome expectations. However, as behavior change is a multidimensional construct with a number of interacting variables, over time even small differences in self-efficacy, for example, can have a cumulative effect. Effective lifestyle change requires that an individual is successful in performing the “new” behavior time after time, not only once, until the new behavior becomes a habit. Therefore, participants with even slightly higher self-efficacy, positive outcome expectancies, and intentions may have significantly better chances over time to be successful in shaping their behavior in the long-term. The present study has a number of limitations. The results of the analyses should be taken as indicative only as they are based on retrospectively observed group membership without establishing a causal relation between the PREMIT program and changes in the psychological variables. The participants were not only highly motivated at the beginning, but also the stage 1 of the PREMIT was relatively short (8 weeks), leaving limited scope for improvements. Therefore, it is important that future research examines the influence of the PREMIT program on the behavioral determinants over the implementation and maintenance periods of the behavior change. Further, due to technical issues, outcome expectancies data were missing in part for one of the study sites. Despite limitations in the study design, it can be concluded that while the PREMIT program appears to be effective in supporting pre-diabetic individuals in initial weight loss efforts and in preparation for changes in physical and dietary habits, younger participants with family commitments may struggle to attend the intervention sessions and thus miss vital support. The authors acknowledge Edith Feskens (Wageningen University, the Netherlands) in supporting the work to develop this manuscript. The authors also wish to acknowledge all the additional people who have worked and are currently working for PREVIEW including trainees, post- and undergraduate students. Finally, a respectful thank you to all the study participants that took part in PREVIEW. EU 7th Framework Programme (FP7/2007–2013) under grant agreement no. 312057, The National Health and Medical Research Council—EU Collaborative Grant, AUS, The NZ Health Research Council (14/191) and UoA Faculty Research Development Fund, The Cambridge Weight Plan kindly donated all products for the 8-weeks low-calorie diet period, Academy of Finland (grant numbers 272376, 266286, 314383), Novo Nordisk Foundation, Finnish Diabetes Research Foundation, Gyllenberg Foundation. University of Copenhagen, Denmark: Ulla Skovbæch Pedersen, Marianne Juhl Hansen, Bettina Belmann Mirasola, Maria Roed Andersen, Anne Wengler, Jane Jørgensen, Sofie Skov Frost, Eivind Bjørås, Grith Møller, Lone Vestergaard Nielsen; University of Helsinki, Finland: Elli Jalo, Saara Kettunen, Laura Korpipää, Tiia Kunnas, Heini Hyvärinen, Heikki Tikkanen, Sanna Ritola; University of Nottingham, UK: Elizabeth Simpson, Shelley Archer, Natalie Bailey-Flitter, Nicky Gilbert, Laura Helm, Sally Maitland, Melanie Marshall, Theresa Mellor, Grace Miller, Seodhna Murphy, Vicky Newman, Amy Postles, Jakki Pritchard, Maria Papageorgiou, Cheryl Percival, Clare Randall, Sue Smith, Sarah Skirrow; University of Navarra, Spain: Blanca Martinez de Morentin Aldabe, María Hernández Ruiz de Eguilaz, Salomé Pérez Diez, Rodrigo San-Cristobal, Maria dels Angels Batlle, Laura Moreno-Galarraga, Alejandro Fernández-Montero, Marian Nuin, Javier Baquedano, Maria Eugenia Ursúa, Francisco Javier Martinez Jarauta, Pilar Buil, Lourdes Dorronsoro, Juana María Vizcay, Teodoro Durá-Travé, and all general practitioners and nurses from the Navarra Health Services who collaborated in the recruitment of the participants; Medical University of Sofia, Bulgaria: Nadka Boyadjieva, Pavlina Gateva-Andreeva, Georgi Bogdanov, Galina Dobrevska; University of Auckland, New Zealand: Amy Liu, Lindsay Plank, Anne-Thea McGill, Madhavi Bollineni, Kelly Storey, Nicholas Gant, Jonathon Woodhead, Hannah Chisholm, Wonjoo Lee, Chelsea Cheah, Eric Hansen, Hacer Tekinkaya, Nadia Harvey, Clarence Vivar; University of Sydney, Australia: Roslyn Muirhead, Kylie Simpson, Michele Whittle, Kirstine Bell. The PREVIEW project was designed by Anne Raben (University of Copenhagen, Denmark), Jennie Brand-Miller (University of Sydney, Australia), Margriet Westerterp-Plantenga (University of Maastricht, the Netherlands), Mikael Fogelholm (University of Helsinki, Finland), Wolfgang Schlicht (University of Stuttgart, Germany), and Edith Feskens (Wageningen University, the Netherlands). The PREVIEW intervention study for the adult participants was designed by Anne Raben (University of Copenhagen, Denmark), Mikael Fogelholm (University of Helsinki, Finland), Jennie Brand-Miller (University of Sydney, Australia), and Thomas Meinert Larsen (University of Copenhagen, Denmark). The PREMIT behavior modification intervention was designed by Wolfgang Schlicht (University of Stuttgart, Germany), Daniela Kahlert (University of Stuttgart, Germany), and Annelie Unyi-Reicherz (University of Stuttgart, Germany). MHL is the guarantor of this work and it was MHL’s idea to examine the associations between social-cognitive variables between “achievers” and “non-achievers” during the initial 8-week weight loss phase (Phase I) of the PREVIEW RCT. All authors contributed to analyses, interpretation of data, drafting the manuscript, and critical revision of the manuscript for intellectual content. World Health Organization. Global report on diabetes. Geneva: World Health Organization; 2016. Available from: http://apps.who.int/iris/bitstream/handle/10665/204871/9789241565257_eng.pdf. Accessed April 1, 2017. McGuire H, Longson D, Adler A, Farmer A, Lewin I. Management of type 2 diabetes in adults: summary of updated NICE guidance. BMJ. 2016;353.i1575. World Health Organization. Definition, diagnosis and classification of diabetes mellitus and its complications: Report of a WHO consultation. Part 1: Diagnosis and classification of diabetes mellitus. Geneva: WHO; 1999. Png ME, Yoong JS-Y. Evaluating the cost-effectiveness of lifestyle modification versus metformin therapy for the prevention of diabetes in Singapore. PLoS One. 2014;9(9):e107225. Diabetes Prevention Program Research Group. Reduction in the incidence of type 2 diabetes with lifestyle intervention or metformin. N Engl J Med. 2002;346(6):393–403. Lindström J, Louheranta A, Mannelin M, et al. The Finnish diabetes prevention study (DPS). Lifestyle intervention and 3-year results on diet and physical activity. Diabetes Care. 2003;26(12):3230–3236. Alouki K, Delisle H, Bermúdez-Tamayo C, Johri M. Lifestyle interventions to prevent type 2 diabetes: a systematic review of economic evaluation studies. J Diabetes Res. 2016;2016:2159890. Gillett M, Royle P, Snaith A, et al. Non-pharmacological interventions to reduce the risk of diabetes in people with impaired glucose regulation: a systematic review and economic evaluation. Health Technol Assess. 2012;16(33):1–236. Fogelholm M, Larsen T, Westerterp-Plantenga M, et al. PREVIEW: Prevention of diabetes through lifestyle intervention and population studies in Europe and around the world. Design, methods, and baseline participant description of an adult cohort enrolled into a three-year randomised clinical trial. Nutrients. 2017;9(6):632. Ahlin K, Billhult A. Lifestyle changes—a continuous, inner struggle for women with type 2 diabetes: a qualitative study. Scand J Prim Health Care. 2012;30(1):41–47. Penn L, Dombrowski SU, Sniehotta FF, White M. Participants’ perspectives on making and maintaining behavioural changes in a lifestyle intervention for type 2 diabetes prevention: a qualitative study using the theory domain framework. BMJ Open. 2013;3(6):e002949. Følling IS, Solbjør M, Helvik A-S. Previous experiences and emotional baggage as barriers to lifestyle change—a qualitative study of Norwegian Healthy Life Centre participants. BMC Fam Pract. 2015;16(1):73. Michie S, Johnston M, Francis J, Hardeman W, Eccles M. From theory to intervention: mapping theoretically derived behavioural determinants to behaviour change techniques. Appl Psychol. 2008;57(4):660–680. Davis R, Campbell R, Hildon Z, Hobbs L, Michie S. Theories of behaviour and behaviour change across the social and behavioural sciences: a scoping review. Health Psychol Rev. 2015;9(3):323–344. Michie S, Johnston M, Abraham C, Lawton R, Parker D, Walker A. Making psychological theory useful for implementing evidence based practice: a consensus approach. Qual Saf Heal Care. 2005;14(1):26–33. Sutton S. Determinants of health-related behaviours: theoretical and methodological issues. In: Stephen S, Andrew B, Marie J, editors. The Sage Handbook of Health Psychology. London: SAGE; 2004:94. Fishbein M, Triandis HC, Kanfer FH, Becker M, Middlestadt SE, Eichler A. Factors influencing behavior and behavior change. In: Baum A, Revenson TA, Singer JE, editors. Handbook of Health Psychology. Mahwah, NJ: Lawrence Erlbaum; 2001:3–17. Stokols D. Establishing and maintaining healthy environments: toward a social ecology of health promotion. Am Psychol. 1992;47(1):6–22. National Institute for Health and Care Excellence. Behaviour Change: Individual Approaches. London: NICE; 2014. Available from: https://www.nice.org.uk/guidance/ph49/resources/behaviour-change-individual-approaches-pdf-1996366337989. Accessed March 15, 2017. Presseau J, Ivers NM, Newham JJ, Knittle K, Danko KJ, Grimshaw JM. Using a behaviour change techniques taxonomy to identify active ingredients within trials of implementation interventions for diabetes care. Implement Sci. 2015;10:55. Kahlert D, Unyi-Reicherz A, Stratton G, et al. PREVIEW behavior modification intervention toolbox (PREMIT): a study protocol for a psychological element of a multicenter project. Front Psychol. 2016;7:1136. Prochaska JO, DiClemente CC. Stages of change in the modification of problem behaviors. In: Hersen M, Eisler RM, Miller P, editors. Progress on Behavior Modification. Sycamore, IL: Sycamore Press; 1992:184–214. Prochaska JO, Velicer WF. The transtheoretical change model of health behavior. Am J Heal Promot. 1997;12(1):38–48. Schwarzer R. Social-cognitive factors in changing health-related behaviors. Curr Dir Psychol Sci. 2001;10(2):47–51. Bandura A. Social cognitive theory of human development. In: Husen T, Postlethwaite TN, eds. International Encyclopedia of Education. 2nd ed. Oxford: Pergamon Press; 1996:5513–5518. Ryan R, Deci E. Self-determination theory and the facilitation of intrinsic motivation, social development, and well-being. Am Psychol. 2000;55(1):68–78. Schwarzer R, Renner B. Social-cognitive predictors of health behavior: Action self-efficacy and coping self-efficacy. Health Psychol. 2000;19(5):487–495. Delahanty LM, Conroy MB, Nathan DM; Diabetes Prevention Program Research Group. Psychological predictors of physical activity in the diabetes prevention program. J Am Diet Assoc. 2006;106(5):698–705. Dill EJ, Manson SM, Jiang L, et al. Psychosocial predictors of weight loss among American Indian and Alaska native participants in a diabetes prevention translational project. J Diabetes Res. 2016; 2016:1546939. Miller CK, Weinhold KR, Nagaraja HN. Impact of a worksite diabetes prevention intervention on diet quality and social cognitive influences of health behavior: a randomized controlled trial. J Nutr Educ Behav. 2016;48(3):160–169.e1. Ajzen I. Perceived behavioral control, self-efficacy, locus of control, and the theory of planned behavior. J Appl Soc Psychol. 2002;32(4):665–683. Sarafino EP. Health Psychology—Biopsychosocial Interactions. 4th ed. USA: Wiley & Sons; 2002. Critchley CR, Hardie EA, Moore SM. Examining the psychological pathways to behavior change in a group-based lifestyle program to prevent type 2 diabetes. Diabetes Care. 2012;35(4):699–705. Maddux JE, Sherer M, Rogers RW. Self-efficacy expectancy and outcome expectancy: their relationship and their effects on behavioral intentions. Cognit Ther Res. 1982;6(2):207–211. ESS. European Social Survey. (2015). ESS round 7 (2014/2015) Technical Report. London; 2015. Renner B, Schwarzer R. Risk and health behaviors—documentation of the scales of the research project: “risk appraisal consequences in Korea” (RACK). Int Univ Bremen Freie Univ Berlin. 2005: 27–28. http://www.gesundheitsrisiko.de/docs/RACKEnglish.pdf. Tabachnick BG, Fidell LS. Using Multivariate Statistics. Fourth edition. USA: Allyn and Bacon; 2001. Field A. Discovering Statistics using IBM SPSS Statistics. 4th ed. New Delhi: SAGE Publications; 2013. Bandura A. Self-regulation of motivation through anticipatory and self-reactive mechanisms. In: Dienstbier RA, editor. Perspectives on Motivation. Vol. 38. Lincoln NE: University of Nebraska Press; 1991:69–164.